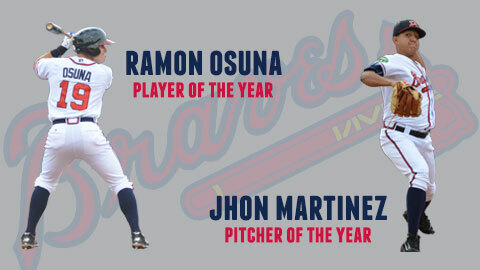 DANVILLE, Va. - The Atlanta Braves announced their organizational Pitcher and Position Player of the Year awards Friday, with Jhon Martinez and Ramon Osuna taking home the honors for Rookie-level Danville. Martinez and Osuna will be honored in a special on-field presentation tonight prior to the Braves' game against the New York Mets at Turner Field in Atlanta. Martinez earned Danville's Pitcher of the Year award after leading the D-Braves' rotation with a 3.21 ERA. Martinez hurled 61.2 innings for Danville, just 1/3 of an inning behind Jaret Hellinger for the most on the team. Martinez led the team with four wins, posting a 4-6 record in 12 starts. He allowed 68 hits and 31 runs (22 earned), while striking out 45 and posting a 1.36 WHIP. Osuna paced the D-Braves' offense with a .276 average, second only to Matt Gonzalez (.300) among players who spent the entire season in Danville. Osuna was second on the team in both home runs (4) and RBI (28). He posted a slash line of .276/.423/.766 in 47 games played and 163 at bats.